Download a blank fillable Dd Form 2815 - Alternate Dispute Resolution (Adr) Report in PDF format just by clicking the "DOWNLOAD PDF" button. 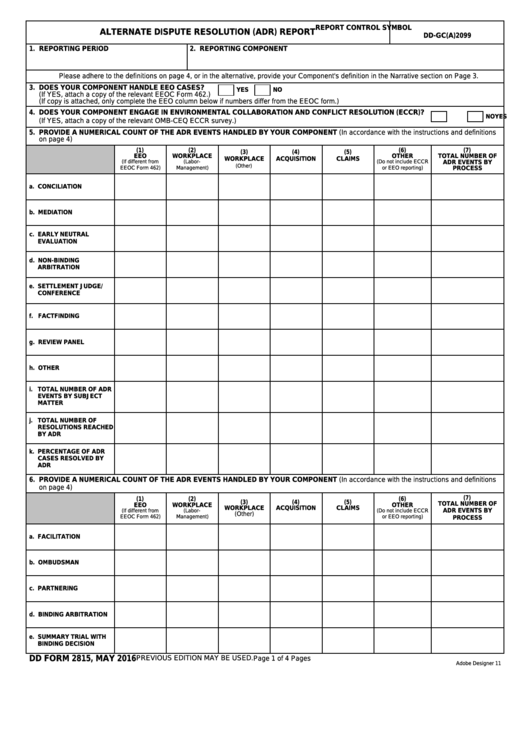 Complete Dd Form 2815 - Alternate Dispute Resolution (Adr) Report with your personal data - all interactive fields are highlighted in places where you should type, access drop-down lists or select multiple-choice options. Please adhere to the definitions on page 4, or in the alternative, provide your Component's definition in the Narrative section on Page 3. 3. DOES YOUR COMPONENT HANDLE EEO CASES? 4. DOES YOUR COMPONENT ENGAGE IN ENVIRONMENTAL COLLABORATION AND CONFLICT RESOLUTION (ECCR)?